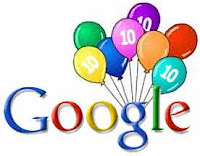 10 Years of Google Part Six: What Does Google Mean to You? So Google turns 10 this month. Have you thought of the profound impact Google has had on our lives? For me personally it has changed my life immensely. Although when I first went online my search engine of preference all those years ago was ASK Jeeves (now ASK.com). The simple reason for this is that Google was not around yet. I'm not sure of the first time I used Google. To tell you the truth I'm not sure if my first Google experience was a successful one or not. I do know that fairly early on I was intrigued by Google's results. A query in Google appeared to return more relevant results than a Yahoo or an MSN or Netscap or even my favorite at the time ASK Jeeves. Today Google is an everyday part of my life. In fact I spend more time interacting with Google than I do with other aspects of my life. My career as a search strategist means that from 7:30 in the morning until 3, 4, or 5 in the afternoon I am using Google as a tool to help my clients communicate their brand and their solutions to the millions of Web searchers out there. In the evening when I go home for the day, I'll use Google to go online and search for more information. The Google Toolbar is a part of all of the Web Browsers that I use. I have a personalized iGoogle page that allows me to follow the things that are of interest to me. To Google is an assumed practice with me. It's become a way of life. You cannot really compare Google to anything. Is Google to my generation like TV was to previous generations? Working in the search industry means that as a marketer I tread new waters each and eveyday. Technology has changed and continues to chnage how we search for information. Google is an effective tool that allows us to search for and find information that previously was unavailable or meant searching through reams of newspapers or magazine articles or dictionaries or telephone books or encyclopedias. What Has Google Done For Me? Google has helped teach me about RSS and syndication of content, online video, blended search, XML, blogging, website usability, eye tracking and much more. Google has had both a positive and negative impact on my life. However I think that positive aspects that Google has brought to my life outweigh the negative. Google is a fascinating company and their innovation continues to impress me. I'm glad Google has been around for ten years. I'm excited about their next ten years. From starting with a team of 8 people in 1998 to a Global business with 20,000 employess ten years later, Google is the greatest modern day success story that we have had the privilege of experiencing.